Um, excuse me, but . . . do these children come with dental? Sarah Parshall Perry knew that raising kids would be different from climbing the corporate ladder. But she wasn't ready for just how different. Wasn't a job just a job? And what was that on her shirt? Sarah left the corporate world with a plan to win at mothering and was downright blindsided. Nothing went as planned, everything was foreign, and her bosses didn't always understand her value to the organization. With her signature wit, lawyer-turned-stay-at-home-mommy Sarah says what all of us are thinking when we trade annual reports for homework help and sleepless nights. Sarah invites you to laugh alongside her in the "Are you kidding me?!" moments that come with the job of growing people. Crossing the divide between "employee" and "mother" is hard. But thankfully, it's also hilarious. This book isn't just her story. It's your story. The story of every mother who gives up one thing to get something better--and ends up finding out what she's worth along the way. Now, I'll be honest, I'm probably not the most ideal audience for this book. You see, I was married very young- just 19 years old- and had my son just before turning 20. I had not had time to establish a career before becoming a mother, so I wasn't really giving anything up. Don't get me wrong, I'd had jobs before- fast food, working at a theme park, tutoring... but these are simply jobs. They were not careers I had studied for and worked towards, they were not my life. They were simply a way to have a little extra spending money. When I started my family, I knew right away that the plan was for me to stay home with my children. It was never even really something I had to give much thought to, that's just what seemed most natural for myself and my family. My experience in becoming a mother was vastly different that of Sarah Parshall Perry. Though I couldn't relate to every of her story, there were many parts that I think were truly universal to us all...the unexpectedness of it all, the challenges, the joys, the laughs. I found myself laughing and nodding right along with her. So, while I may not be the target audience, I still enjoyed it. Still, I know that this is one that those mamas who did give up a career will enjoy even more. They will see themselves and some of their own experiences and come to the realization that they are not alone in this motherhood journey and those thoughts and feelings that they have felt. Ready to laugh right along the journey from career woman to mom? 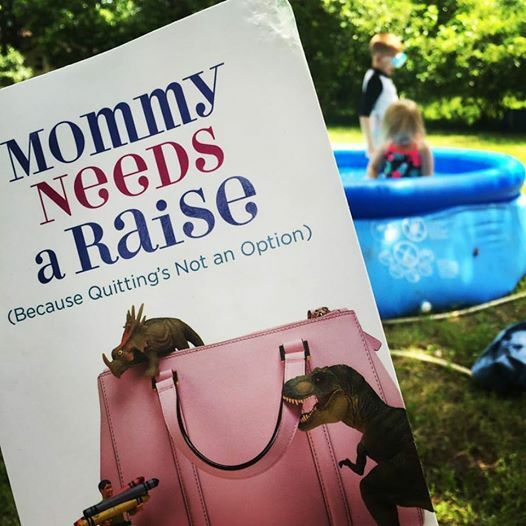 Mommy Needs a Raise is available to purchase now. I sure was in for a surprise when my son was born! I do not think a Mom can really understand what it means to become a Mother until she experiences it. It is a lot harder than I thought. And having my daughter after my son, was really hard too! But I would not give them up for the world! I love them so much. This sounds like a good book, I would like to check it out. Many towns in my area (inc. my own) are extremely restrictive about home based biz.I'm thinking of moving so I can do something from home, but it is also expensive to relocate! Oooh this sounds so perfect!! I am going to pick this up after Im done with the book Im reading right now! !